AnceStories: The Stories of My Ancestors: Picnic Time! *What food does your family serve at picnics? Our annual must-attend picnic is my parents' Fourth of July picnic at their beautiful log home on the mountainside north of Colville, Washington. Traditionally, we grill hamburgers and hot dogs and have all the condiments: ketchup, mustard, mayo, pickles and/or relish, onion, lettuce, and tomatoes. There's usually potato salad, potato chips, and there MUST be baked beans. That's because Dad, like myself, is a traditionalist. He swears that at every Robbins Reunion that he attended as a kid there was nothing served but beans and dessert. Apparently there were dozens of bean dishes. He tells me this every year, and every year I remember that he inherited the Robbins' gene for storytelling, which although it always starts out with the truth, tends to grow and take on a life of its own! Mm-hmm. When my niece's family comes, they almost always brings a cold three-bean salad that I love. There are often veggie and fruit trays, soft drinks, and several desserts. Janet (Mom's friend) always brings a peanut-butter pie. When work kept her away this Fourth, her husband Pete did the honors. *Are there traditional foods or family recipes? Dad does have a special recipe for the beans. He starts out with canned baked beans, but adds all kinds of yummy stuff: mustard, molasses, etc. Can't be beat! I usually make a Jello Wave Your Flag cake. *Is there one particular relative's specialty you wish you could taste again or one perfect picnic day you wish you could go back and relive? One of my favorite times was a Spring Break when I was a high school junior, I think. The weather was beautiful, we had a picnic with a bonfire and roasted hot dogs and marshmallows for s'mores. Then we came in and watched "The Music Man" on TV. *You could expand to write about family reunions, past and present, and what kinds of foods were/are brought to them. As a child, I only remember attending one reunion, the Lewis family reunion in 1979 in Michigan. I have no idea what we ate, but I do remember that one of the great-granduncles had an ice cream cart! At the Midkiff Family Reunions that I coordinated in 1990 and in 1999 in the Spokane Valley, we split up the list of names and had one group bring main dishes, one bring salads and side dishes, and the third, desserts. Everyone had to bring their own meat to grill. The reunion committee supplied buns, condiments, beverages, and paper/plastic goods. It worked out well. *You could add what dish everyone loved to eat, and which one people were sneaking off to scrap into the garbage so they wouldn't hurt the cook's feelings! Everyone loves my Wave Your Flag cake. Janet has an interesting story about her peanut butter pie. Seems her Aunt Ruth is a horrible cook, yet Janet's husband Pete is always polite and will eat whatever Ruth sets before him. One time, Ruth mentioned she had made a peanut butter pie. Janet quickly declined, but Pete of course took a serving. He started nudging Janet, "You've got to try this!" Janet couldn't believe it! Aunt Ruth had finally made something edible, and not only that, delicious! And Janet blesses us by bringing one to the Fourth of July picnic/BBQ every year! *Is there a picnic basket, old ice chest, a BBQ grill or camp stove, a special dish (physical, not recipe) or picnic cloth that's been handed down in the family and used for decades at picnics, potlucks, or reunions? We have a picnic basket that used to belong to Norm's great-grandparents. I use it as a decorative piece in my dining room, but very occasionally we'll use it. Norm's dad loves garage sales, and he's found us a few old metal green Thermoses. He'll fill one with coffee for us before we leave their place for our long ride home. *Is there a favorite campground, park, home, or meeting place where picnics or reunions regularly occurred? There's a great little campground north of Colville at Mill Creek. We camped there for a few days in our camper when my parents first bought their home and we were waiting for the family to move out. Then we decided to take a trip back to Michigan, but that's another story! This campground has a swinging bridge that my dad and brother used to play on when my brother (now 34) was five years old. Adriaen would trip across the bridge, and my dad would pretend to be the troll from Billy Goats Gruff. My brother was gut-giggling so hard, he nearly fell off the bridge! Near the falls there's a great rock with drill holes in it from when the mill used to be there, gosh, 150 years ago? That rock is a good place to sit while fishing. *What about unwelcome guests like ants, mosquitoes, and yellow jackets? Raccoons, anyone? My son, Matthew, is a yellow jacket and mosquito magnet. I tell him it's because he's so sweet! I can't tell you how many picnics and play days we had at lakes and streams where he'd get bit/stung. Fortunately, he's not allergic. *What favorite picnic or reunion photos do you have, especially ancestral? 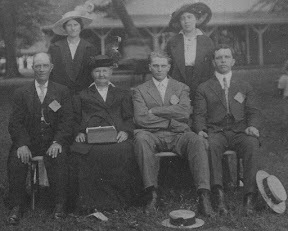 I've got one of my mother's ancestors, the Valks at a picnic, and another of a Lewis family reunion taken around 1924. Source: The Valk Family. Photograph. Taken c. 1915 - 1918, probably in Grand Rapids, Kent Co., Michigan. Original photograph believed to be in the possession of John Hanson, Little Silver, New Jersey. 2000. Source: The Lewis Family Reunion. Photograph. Taken c. 1924, probably in Muskegon Heights, Muskegon Co., Michigan. Original in the possession of Jeanne Holst Robbins, Sault Ste. Marie, Michigan. 2008. Reprint held by Miriam Robbins Midkiff, Spokane, Washington. 2008. *Beverages served, games and activities played, stories told...all contain memories that future generations will someday treasure, if they're left for posterity! I especially like Bocci, which I learned to play in my students' PE classes, but I need to buy a set for the next picnic!